I used to fear flying. The whole concept of being lifted into the air in a multi-ton machine sans safety net nor parachute left me anxious and fearful for the length of the flight. Now I embrace it, in fact I love to fly. I lean towards the window short of pressing my nose against it, watching the patchwork of farm fields, creeks and timber passing below as we climb, slipping the surly bounds of earth if only momentarily. Freshly sprouting corn and beans reach for the sky from the rich black soil that my beloved home state of Iowa possesses a great deal. 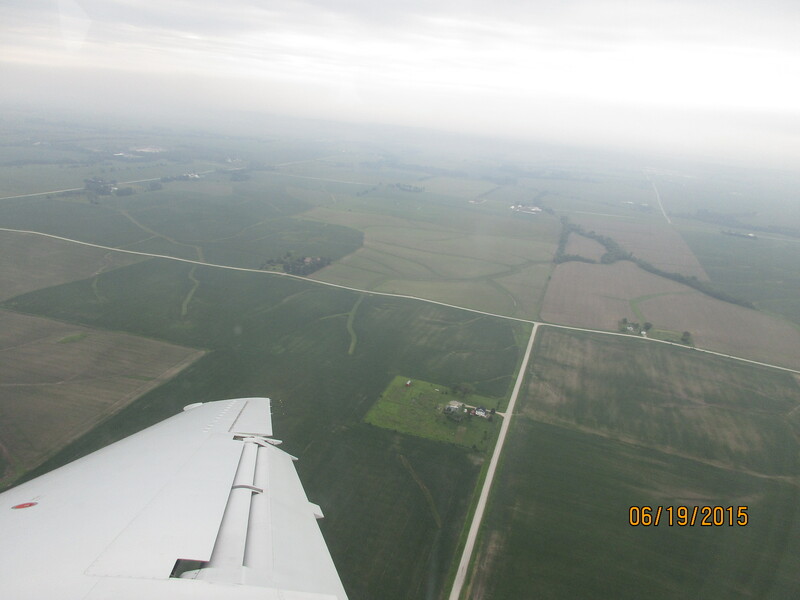 As the jet dips it wing to head east the patchwork quilt of farm fields come into view. A thunderstorm rolling towards us obscures the horizon. When Connie (the honorable Mrs. Ripley) suggested NYC as a vacation destination I was less than enthusiastic. The crime, the traffic, the unknown and my overall worrywartedness (it’s a real condition) made NYC look like optional root canal. Mrs. Ripley pressed on and researched the trip while I mulled over my eventual “yeah….I’ll go” vote (like she already knew that I would). With plans and itineraries in hand we arrived at La Guardia Airport in the morning and promptly took a cab to our hotel, about a thirty minute ride. My wife, Connie, gets motion sickness quite easily. It took her years to get used to my driving. Our taxi’s backseat space was separated from the front seat space by a thick panel of clear arcyrlic….it also separated us from the air-conditioning during the ride. All I can say about our driver is that he should be racing on Sunday’s for NASCAR. The dude was in a zone, bobbing and weaving his way through the Sunday traffic. Accelerating quickly, darting into the next lane before slowing down by sternly applying the brakes. I looked over at Connie, who was now fanning herself and was as white as a ghost. She looked nauseated and irritated. With no barf-bags present I steeled myself against the inevitable ralph which, thank God, never materialized….but it was touch and go there for a while ladies and gentlemen. Being in the back seat of a smoky, hot taxi with a sick SHE-TIGER is a tough way to start our vacation. After we checked in and unpacked we decided that since we still had the better half of a day to explore and sightsee….we did exactly that. 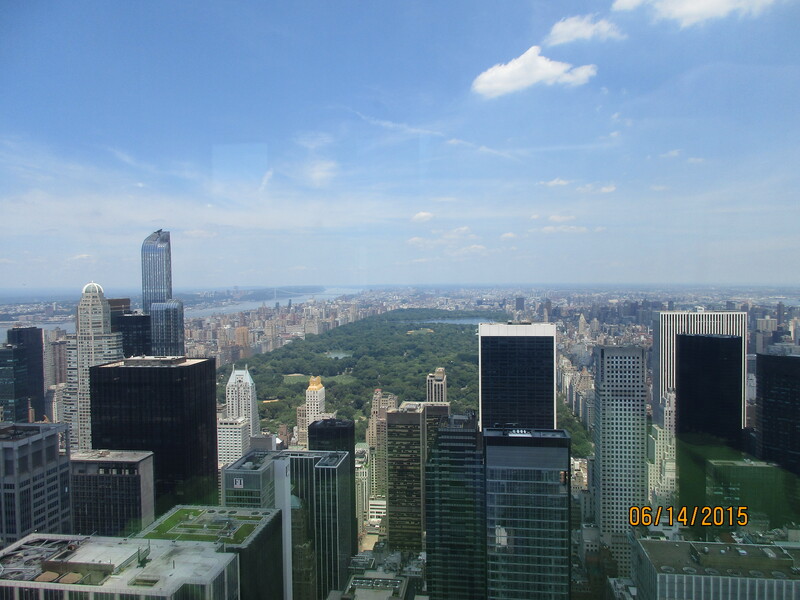 We stayed at the Doubletree Hotel on Times Square which put us in good position to go just about anywhere downtown. 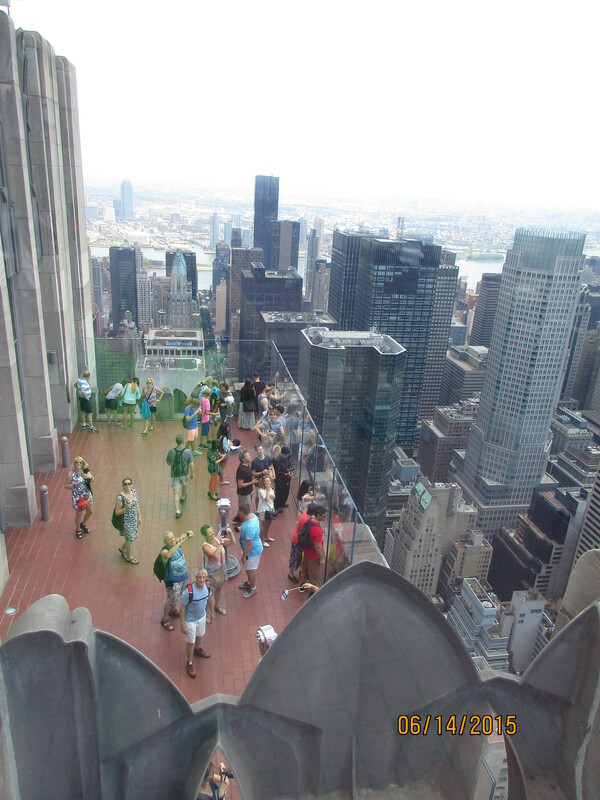 We walked to Rockefeller Center and went up to the viewing platforms on three different levels. That was pretty cool. 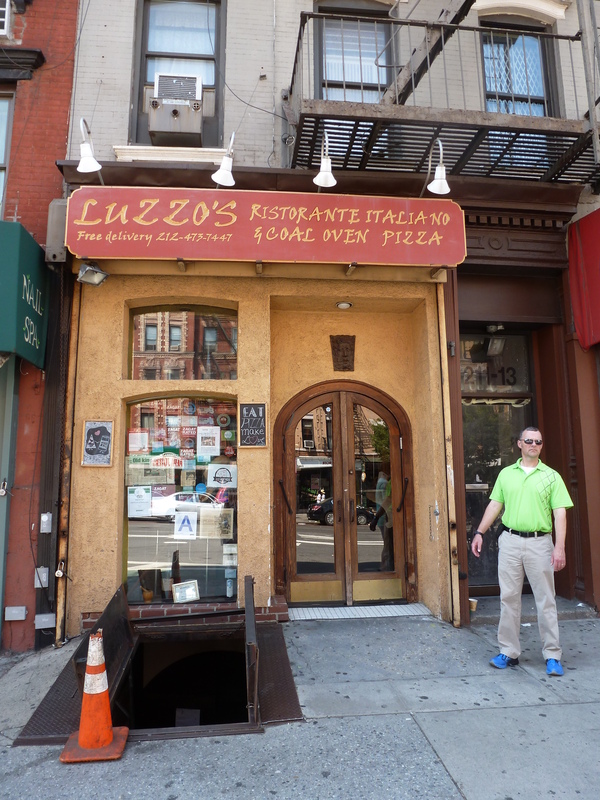 Connie had heard good things about a restaurant called Luzzo’s in East Village so we started down that way. What should have been a 25 minute trek via the subway and walking turned into an hour. Several false starts down wrong streets and not knowing what the heck we were doing made this into more of an expedition, but we finally found it. It’s just a little hole in the wall place. We had skipped dinner and not had much for breakfast either so we were starving. I had a twelve-inch pizza with prosciutto ham and artichokes that was baked in a coal-fired oven. Not too shabby. I devoured the whole thing while Connie had their lasagna. 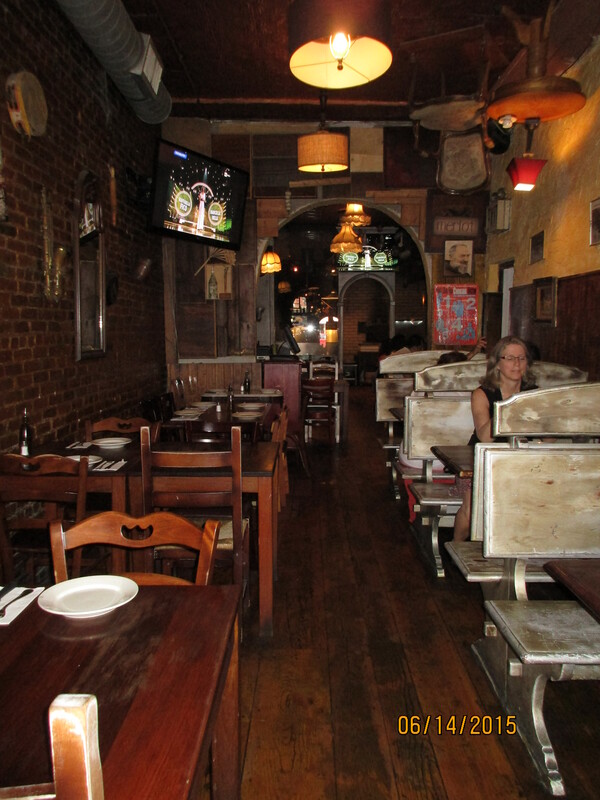 There was an old-timey feel to the place, most likely since it was part of an old brick building. While we were there a guy who promotes “pizza tours” of the city asked the managers permission to bring 12-18 people in every Sunday afternoon around 5PM. I also overheard someone ask the guys in the booth behind us where they were from. New Orleans. They replied that they’d heard about Luzzo’s down there, word of mouth. While I thought that the pizza was really good I didn’t feel that it was the best that I’d ever had. They seem to be “pizza traditionalists” as the manager grimaced and waved off a young lady’s attempt to order a pizza with “half this kind and half another kind”. He was quiet and didn’t speak much English but was nice enough. Great experience, I’m glad that we went there. Jeez….blue shoes, lime green shirt….its a wonder that they let me in through the front door and not the basement. These Coke cans always hit the nail on the head!! 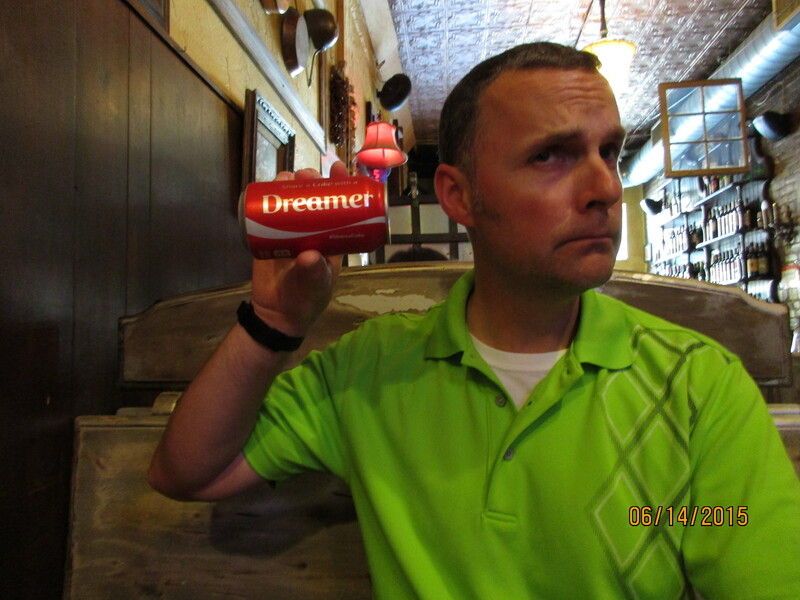 “Dreamer”…fits me like a glove. It’s now 5:30 at night. We’re exhausted and in our room. We began our day at a quarter to four in the morning in rain-soaked Chicago. We’ve had a full day. 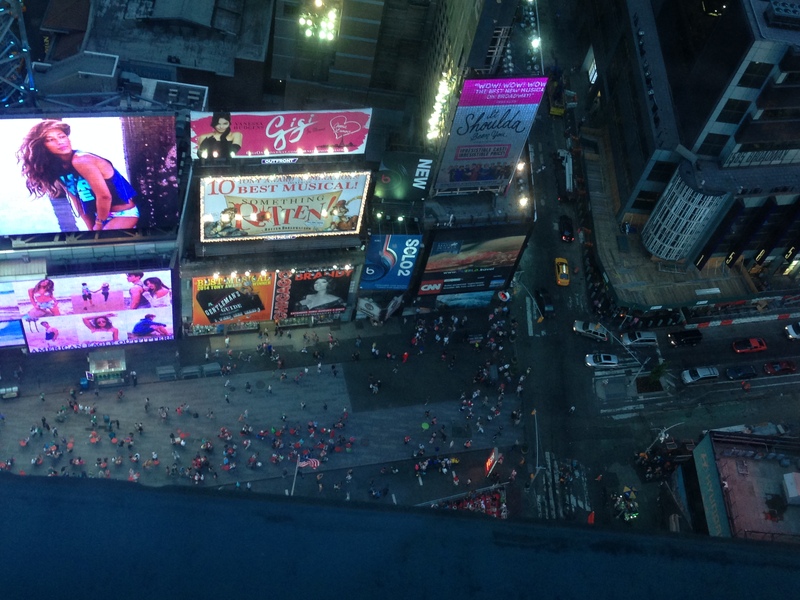 Perched thirty-one floors above Times Square we hear the constant commotion that’s going on below us. We find out that its that way all of the time. New Yorker’s don’t drive very much, but those that do are required to honk their horns every twenty seconds, or it would seem that way. I try to rally past my fatigue by eating handfuls of sweet and delicious Garrett’s caramel corn purchased in Chicago and washing it down with ice-cold Coors Light. This combo doesn’t give me the desired effect that I had hoped so I hit the showers and retire for the evening at the heady big-city hour of….9:15….or 8:15 Iowa time. So much for painting the town red our first night in NYC. 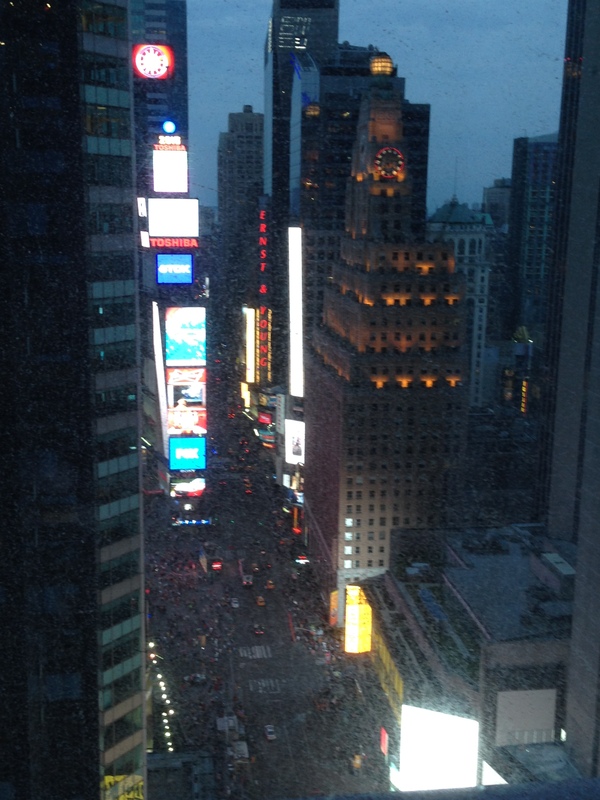 We had a corner room which afforded us a great view of the ball that drops on New Year’s Eve. If the windows had been cleaner…this would’ve been a better photo. Tomorrow we venture out for more sights and sounds of what New York City has to offer. I’ll blog more later on this week, and the weeks to come about our exploits…and “yes”….some of the photos appear out of sequence in relation to the week…we were using our cameras and phones to snap shots so it’ll be a regular collage of photos. If you’ve never read my blog before or wonder why I’m blogging about something that the roughly nineteen million New Yorker’s, plus millions of visitors have already experienced is because I use this blog as a kind of “family and friend newsletter” and creative outlet. Its also because if you’re a blogger, you’re required to write about your vacations, trips, life and fun meals….its part of the blogger constitution and blogger bill of rights. Dead serious. I don’t wish to get into hot water with the blogger union representatives or my tush could be in hot blogger water. So yeah…enjoy our trip with us….its way cheaper that way. Just sayin’. 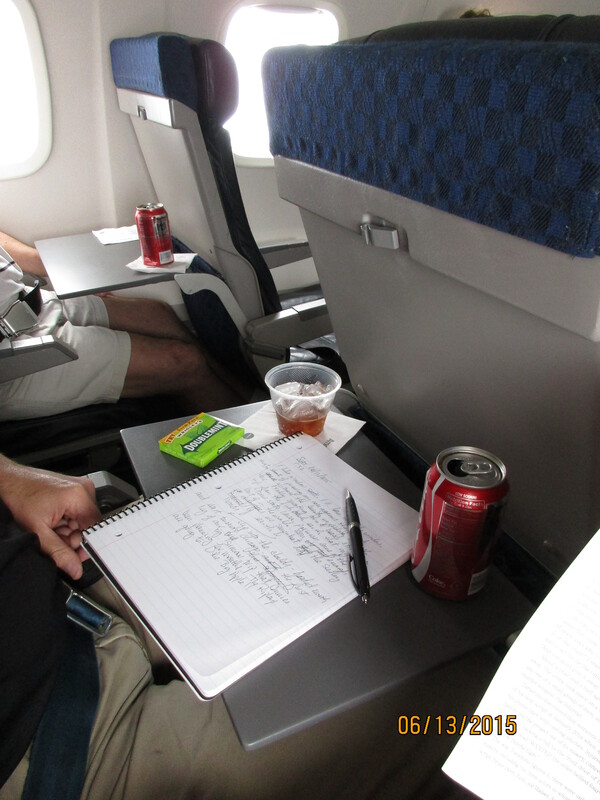 This blog has been brought to you by….Wrigley’s chewing gym and Papermate pens….official pen of RICHRIPLEY. The wheels of thought starting while we were in just under way heading to Chicago. Thank you for reading. Have a great week and God Bless!! I can totally relate to Connie. I, too experienced the joy of a cab ride in the Big Apple. Our driver tried to pick off a street vendor. I buried my head in Tim’s shoulder as I couldn’t bear to look. I just concentrated on my second hand on my watch and that got me through. You will always think of that every time you get into a cab from here on out.